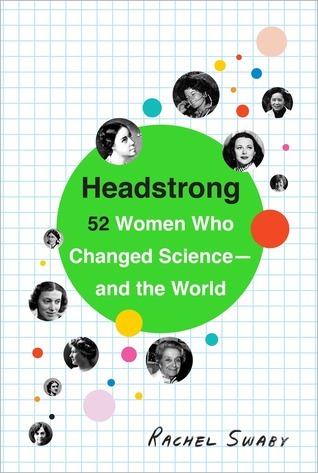 Disclaimer: I received Headstrong: 52 Women Who Changed Science—and the World from NetGalley in exchange for an honest review... and then reviewed it almost two months late. Oops. Regardless, thanks to Crown Publishing/Broadway Books for offering me the chance to read it! The other day I was strolling through a local indie bookshop and noticed that Headstrong by Rachel Swaby had finally hit the shelves. I swelled with pride; this was the very first advance review copy that I'd ever been approved for on NetGalley, and here it was in all its published glory! That little bubble burst as soon as I remembered that I was only halfway through the ARC, despite the fact that the book was released back in early April. Well, better later than never, right? Swaby strikes back against this injustice by painting vibrant, detailed portraits of the women behind a wide swath of scientific breakthroughs, including the inventor of the aquarium (Jeanne Villepreux-Power), the first pioneers in water sanitation testing (Ellen Swallow Richards), food and occupational safety (Alice Hamilton), and in vitro fertilization (Anne McLaren), and the discoverer of the earth's inner core (Inge Lehmann). We also learn about Rosalind Franklin, whom Watson and Crick scooped in the announcement of DNA's double-helix structure (Watson went on to insult Franklin's taste in fashion, classy guy that he is), and Emmy Noether, a brilliant mathematician whom Einstein spoke of as the reason he became competent in certain aspects of calculus. The list goes on and on. Of all the magnificent women Swaby spotlights, her profile of Hedy Lamarr stood out to me in particular. Born in Vienna, Lamarr went on to become both a famed Hollywood actress and a significant contributor to methods that allowed for better guidance of torpedoes and the invention of Wi-Fi, GPS and other technology. Sadly, the only place I'd ever heard of Lamarr before this book was in Little Shop of Horrors, in reference to how hot a date she would be. Lamarr's story isn't unique in this regard; nearly all of these women's careers were rife with sexism. It's maddening (if unsurprising) how reluctant universities once were to allow women among their student and faculty ranks. Some other reviewers have complained that Swaby seemed to favor quantity over quality in her profiles, but I would have to disagree. I would have been glad to have a few more pages about certain women, but I'm happy that she featured a large number of accomplished scientists and gave them the due they've long deserved. I would recommend this book for anyone with even a passing interest in science and a desire to learn more about some of the countless women who helped shape the much more convenient, safe and technologically-sophisticated world we live in today. Have any of you read Headstrong? What did you think? Let's chat! Ok, yes. Given my mood and reading proclivities, this is right up my alley. Great review. And I'm always of the "better late than never" school of thought. I'm so glad you liked this one! I can't get anyone I know IRL to read it, but I think it deserves more love all around. As far as the "quantity vs. quality" debate... I think there's room for this type of book in those little spaces between the rest of life (a quick coffee break at work, waiting in line at the DMV, a particularly bad evening in the bathroom... ahem). Which means that even though it isn't particularly bulky, it might still take a while to read. And that's OK! Ah! I so need to read this too. I am really glad you liked it. Maybe this will be a good positive balance to my depressing fiction read. This sounds wonderful! If I could handle nonfiction, I'd totally jump on it bc it seems very important and interesting. You'll just have to regale me with details of each woman. thanks in advance. This sounds awesome! I saw a book at BEA called The Only Woman in the Room: Why Science is Still a Boys' Club that sounds like it would be right up your alley. (I feel like I also saw someone mention it on Twitter or in a blog post -- was that you?) The Popaganda podcast also did a great episode about women in science recently! Oh, I LOVE the way you explained how you can read this fairly short book in snippets (especially the bathroom part, that had me chuckling). I found that, if you're really itching for more info about each woman, you can definitely find it online! I like to think Swaby was just giving us a well-rounded taste of each scientist's story. Oh, I bet it would be! You would have to deal with the usual sexism toward women in a male-dominated field, but, other than that, it's the opposite of depressing. I'll tell you about a new one each week. Oh gosh, I'm utter crap at keeping up with podcasts, but I'll keep my ears open for this one.